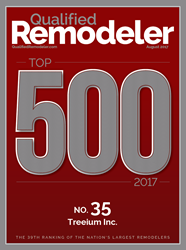 The numbers have spoken, and Treeium has ranked in the top 50 out of 500 accomplished remodeling firms in the nation. “Being on the forefront of technological and eco-friendly advances has enabled us to become the standard when it comes to remodeling on the West Coast” Says Moty Ginsburg, CEO of Treeium Inc.
Treeium Inc., a California based home remodeling company focusing on eco-sustainability, has placed number 35 on this years Qualified Remodelers Top 500 remodeling firms list. This will be the 5th year in a row that Treeium has earned a prominent position on this revered list. Better yet, it ranks #1 in California and #5 in the Nation for Full-service remodeling. “Being on the forefront of technological and eco-friendly advances has enabled us to become the standard when it comes to remodeling on the West Coast,” says Moty Ginsburg, CEO of Treeium. “As a result, we were able to earn this esteemed ranking from such a distinguished magazine as Qualified Remodeler." Founded in 1975, Qualified Remodeler (QR) is the premier publication serving contractors who specialize in residential and light commercial remodeling. QR is mailed monthly to an audience of 80,800 remodeling company owners and executives, architects and suppliers. It was the first publication to serve the remodeling market and is sent to more residential remodelers than any other remodeling magazine. Treeium is a general contracting company based in California with over 26 years of experience, specializing in eco friendly remodeling. We believe that change starts from the inside out, and that the home is a great place to start. We believe that every need can be answered by a green solution which is why we offer remodeling services that help our customers create their dream homes in an efficient, sustainable, healthy way for both their families and the planet.